Garlic is a cook’s best friend. Garlic has been used for thousands of years to spice up various dishes, from seafood to salads to steaks. Most people associate garlic with its distinctive, strong taste but its a versatile addition to many different recipes and tastes very different depending on whether it is baked, sauteed, or roasted. 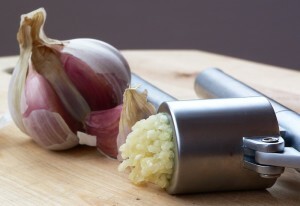 Garlic flavor can also change depending on how fresh it is and how finely you mince or chop it. Different varieties of garlic also have very different tastes — another reason to give up grocery store garlic and start experimenting with gourmet garlics. One bite of a gourmet garlic is often enough to forever turn many people off the bland garlic sold in most stores. If you just want the recipes, scroll to the bottom of this page and you’ll find some of our favorite garlic recipes, broken out by course. We’re constantly adding new recipes so be sure to check back frequently! 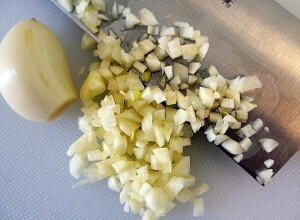 Mincing and chopping usually mean the same thing in most garlic recipes. We wanted to add a few quick pointers and quick tips, as not everyone is familiar with garlic and it can be easy to go astray when you first start cooking with it. Some garlic recipes call for chopping cloves while others specify mincing or crushing. Chopping and mincing are often used interchangeably; crushing usually means to run the garlic through a garlic press or mince and crush it with the flat of a knife blade until it is a paste. Be careful when sauteing garlic with other vegetables such as onions. That’s a common pairing but onions will take slightly longer to cook. 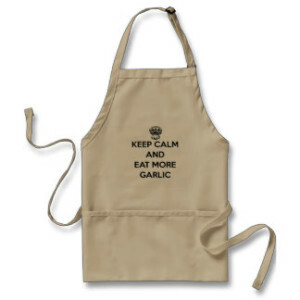 Garlic needs very little sauteing, usually just a minute or two until it turns straw-colored. A head (also called a bulb) of garlic has lots of cloves. When you buy garlic at the store and break it up, all those little things are called cloves. If a recipe calls for two cloves of chopped garlic, use two of the little things, NOT two entire heads of garlic. Really. Eating garlic for the health benefits isn’t always the same as eating for taste. To maximize health benefits, try to eat most of your garlic raw. Roasted garlic is delicious but health benefits are minimal in any garlic recipe that leaves cloves whole and/or cooks garlic at high temperatures for long periods of time.